As Gordon Brown heads for Lisbon this week to negotiate with other EU leaders about the new "Treaty of the Functioning of the EU", Sir Michael Spicer MP and Harriett Baldwin sent him a petition from residents of Worcestershire. 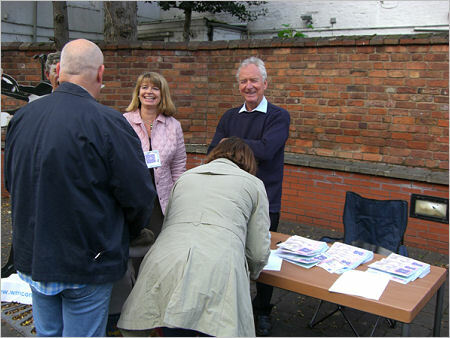 Street stalls have been taking place in Pershore, Malvern and Tenbury and queues of people formed to sign the petition. Harriett Baldwin said, "Gordon Brown promised Britain a referendum on the new EU Constitution in Labour's manifesto. This Treaty is at least 90% the same. Being a member of the EU benefits Britain, but it also costs every household in Britain up to £2000 a year. EU rules make up at least 6 out of 10 of our laws. It's important. I don't think a bunch of politicians should just nod this legislation through. Gordon Brown may have bottled out of a General Election this year, but the British people should be trusted to have their say on this Treaty." Photo: Harriett Baldwin and Sir Michael Spicer, MP with residents of Worcestershire signing the petition.